When the Pride of Baltimore II, “America’s Star-Spangled Ambassador,” sails into the waters of Baltimore’s outer harbor, it passes two land-based forts. On its portside is Fort (William) Smallwood; and on the starboard, Fort (John Eager) Howard. 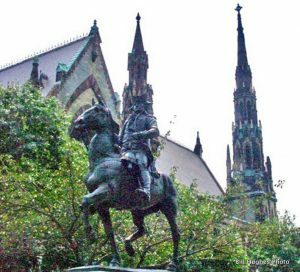 Both of these sites, now popular public parks, were named in honor of two distinguished Revolutionary War heroes. They, with many other gutsy citizens/soldiers, were associated with the fabled “Maryland Regiment,” and America’s noble cause for Independence. In its formative year, 1774, the regiment was called “The Baltimore Independent Company.” Its founding leader was the patriot, Mordecai Gist, a local merchant, then 32 years old. The Maryland Regiment gained its enduring fame in August 1776, at the “Battle of Long Island,” which is also known as the “Battle of Brooklyn.” There, American troops, the Continentals, about 6,000 strong, under Gen. George Washington, were outflanked, and badly outnumbered by the British and Hessian forces of 20,000. In order for the Continentals to gain time to safely retreat from the battlefield and to fight another day, the Maryland Line, with Gist commanding, not only held its position, but valiantly charged, with fixed bayonets, their foe’s fortress-like position. Many died in the daring effort and/or ended up as prisoners of war. Today, marking the Marylanders’ sacrifice is a rusted metal sign. It hangs from the American Legion Post #1636, in Brooklyn, New York. The Legion’s hall is surrounded by garages and auto repair shops. The sign reads: “Maryland Heroes. 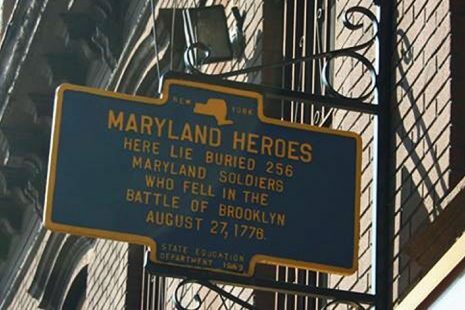 Here lie buried 256 Maryland soldiers Who Fell in the Battle of Brooklyn. August 27, 1776.” If there is such a thing as “Hallowed Ground,” their mass grave, is believed to be located nearby, surely is. We live in an era of monuments galore, but, shamefully, there isn’t one to honor these fallen heroes from Maryland. Hopefully, Patrick K. O’ Donnell’s latest book will correct this glaring oversight. 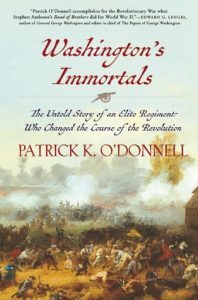 The name of O’Donnell’s well-written, and superbly researched tome, is “Washington’s Immortals: The Untold Story of an Elite Regiment Who Changed the Course of the Revolution.” It’s told from the point of view of the on-the-march citizen/soldier, the daring rebel. He’s fighting the good fight against the British Imperialists. If captured, chances were a soldier would have ended up dead, sooner or later, on one of the 16 British prison vessels berthed in New York Harbor. An estimated 11,500 American POWs died in those filthy hell holes. Their bodies were then tossed overboard. Of the 30,000 Americans captured during the war, “some eighteen thousand died while being held prisoner” by the British. Placed in charge was Col. William Smallwood, a native of Charles County, who was educated at Eton. Gist became a Major in the unit. Also joining the battalion were the likes of Cecil County’s Nathaniel Ramsay and Edward Veazey; Somerset County’s John Gunby; James Peale, brother of the artist, Charles Wilson Peale; Baltimore’s Bryan Philpot Jr., William Sterrett and James Fernandis; Kent County’s John Bantham; Frederick County’s John Hughes; and Anne Arundel County’s Jack Steward and Ben Ford. O’Donell underscored: “Free African-Americans also joined the ranks of Smallwood’s Battalion…This was not only America’s first army, but America’s first integrated army.” Later, hooking up with the regiment, on Manhattan, was another legend, Major Otho Holland Williams. He had participated in the siege of Boston and would later distinguish himself in many of the battles to follow. In a companion Maryland unit, labeled, “The Flying Column,” was found the iconic Capt. John Eager Howard. The Flying Column command was given to Gen. Rezin Beall. Unfortunately, no overall leader of Maryland forces was named between the two. This created an ongoing “dispute” over authority. The Maryland Regiment would see action not only in Brooklyn, but in major key battles throughout the war: Trenton, Stony Point, Camden, Cowpens, Guilford Court House and Yorktown. Over and over again General Washington came to rely on this elite unit. Author O’Donnell has a military background and is considered an expert on elite units. He served as a “combat historian in a Marine rifle platoon during the battle of Fallujah.” As a result, O’Donnell was able to tell the compelling story of the Maryland Regiment by spotlighting the struggles and aspirations of the citizen/soldier in a very intimate and often inspiring fashion. In his book, O’Donnell covered a lot of ground in over an eight year period of combat. Two of my favorite battles related by him, involved the strategic actions utilized in the defense of Fort Mifflin (Mud Island), and at Cowpens. In the first, Lt. Col. Samuel Smith is featured; and at Cowpens, it’s Cmdr. John Eager Howard. As the fates would have it, Smith and Howard had political careers after their outstanding tours of duty in the Continental Army. A monument to Smith stands on Federal Hill, while an equestrian statue to Howard can be found on the north quadrant of Mt. Vernon Place. Smith served in both the U.S. Congress and as Mayor of Baltimore (1835-38). Howard served in the Congress, too, and was later elected as Governor of Maryland (1788-91). It’s a must-read for Revolutionary War and Maryland history buffs alike.